I must admit that I’m pretty good at keeping my own counsel. I did let something very personal out of the bag with one of my friends when I was a little bit the worse for wear (or drunk more to the point!). She was also fessing up about things. Funnily enough neither of us has ever referred to that evening since (not in a bad way but more like we’re pretending we forgot!) That does seem a bit of a cop out for an answer but to be honest I can REALLY keep a secret! 2. Atticus tells Mrs. MacDonagh, “the universe is exactly the size that your soul can encompass. Some people live in extremely small worlds, and some live in a world of infinite possibility.” Then he asks her what she is going to do with the new information she has discovered. What would you do if you found out that other beings were among us? Would you deny it or embrace it? I love that phrase about the universe being the size that your soul can encompass. It’s really quite a beautiful sentiment. I think I might have had a bit more of a jaw dropping moment than Mrs MacDonagh – she barely batted an eyelash when demons and weres were stomping over her lawn! But I’d like to think, and in fact I’m fairly sure, that I would accept it – (although I would undoubtedly think someone was trying to pull my leg). Doubting Tom – looks like a trusting ninny by comparison to me. Given the amount of trouble Atticus manages to find himself in I think his healing power is undoubtedly his best magic ability. That being said his necklace is pretty impressive and has saved his life at least once. And, I like his shape shifting. OMG I can’t choose. But I will. Healing. No, necklace – definitely it’s the magic necklace he’s made – if he hadn’t got the necklace he would be dust and his healing powers would be worthless then! 4. Atticus gets pretty pissed when he finds out that Aenghus Óg is drawing power from the Earth and, in turn, killing it. That’s when Atticus decides he must fight the old Fae for committing such a heinous offense. What is something you would fight for, even if it meant you might die trying? I really love the way Atticus wants to protect the earth – eco warrior! Plus, he’s not even going to run out of town now that his enemies know where he lives, because he wants to stay and fix the forest. Atticus – he is the ‘cuteness’! My children – I realise that’s totally predictable but I would do anything for them and if they were under any type of threat I think I would be possessed with some sort of super power, superhuman strength or something (or maybe I was drinking wine when I typed this answer and let’s face it you’re invincible when you’ve had a drink, not to mention have brilliant judgement, can dance like nobody ever before, look cool, and don’t tuck your skirt into your knickers when you’re at the toilet because your co-ordination is also awesome. I think their battle was much better than I anticipated – it was very real! No hour long thrashing, just straight to the point (no pun intended) and basically Atticus does what he has to do to survive. Plus Aenghus was such a maniac with that armour! Geeky anybody? My favourite parts – difficult! Probably all the internal dialogue with Oberon (although all the funny references to things such as Star Wars, etc comes a close second). Saying that, Oberon is definitely my favourite character (after Atticus that is!!!). I do like the lawyers as well. Witches the least favourite – well at least the double-crossing element. Could I at least give one straightfoward answer today – probably not. I won’t answer this because I’ve already read book two and I’m waiting to finish the readalong before I pick up number three – which will then dovetail very nicely for the release of number four! Anyway, as I said I could keep a secret above it would be pretty stoopid to go and spill the beans now! And, yep, unless something goes seriously wrong I’m set to continue reading about Atticus. I’d like to thank all the lovely ladies above who hosted this readalong. I’ve had a great time and got to meet some lovely peeps. 1. Just after Atticus is shot, Oberon has to “ninja” his way out of the shop and into Hal’s Beamer (with the icky air freshener). Have you ever been in a situation where you had to “ninja” your way out and try not to be discovered? If so, what happened? I like this question and wish I had a good story to go with it but alas no. I’ve had to ‘ninja’ my way into a few situations – sneaking into places where people don’t expect you – but never out! I’ve had to sneak into work – in my first job (it’s a long story), and I’ve had to sneak into friends and relatives houses for surprise parties. Although I guess I’ve snuck out of a few places where I wasn’t enjoying myself but didn’t want to be seen leaving! 2. Atticus’s main goal through a large portion of the book is not only protecting Oberon, but also protecting the sword. You are now living in a paranormal world and you need a weapon! What weapon do you choose and what can it do? I like the sword – it makes people tell the truth when they are under it’s spell – which is pretty cool. I’ve had to give this one quite a bit of thought – it’s not as easy as you think. I suppose if I’m going to have a paranormal weapon it would be the ‘one ring to rule them all’ – no, only kidding, that would make me the Dark Lord (also, it would mean that I’ve now lost the battle of Middle earth, also I would be Aragorn’s enemy and that is NOT going to happen!). I was then thinking maybe a wand – but we all don’t like the witches and wands seems to speak ‘witches’, so no to that. I thought about a magic acorn (like in the film Willow) – that turns things to stone – but I’m a lousy shot so I’d probably end up hitting a nearby tree and turning that to stone which is just plain rude. I think my magic weapon will be an animal – like a Dire Wolf from the Game of Thrones or a Dragon – (is that cheating?) It’s not really a weapon but it would be pretty cool to have a dragon in your corner. Plus, I am a real sucker for dragons! And, as my dragon is devoted to me it will of course let me ride on it’s back when it flies – so that’s a winning combo! Again, not sure about the weirdest place? Slept in some boring places – like Airports due to delayed flights. Plus I always sleep when I’m flying – which most people tell me is weird! (I don’t think so, it’s a great opportunity catch up ona bit of shut eye). I’ve fallen asleep in places that you just wouldn’t fall asleep in – like a disco (with all that noise). I’ve slept in some very inconvenient places – like public transport – so ended up in the wrong place completely. I also quite frequently fall asleep at some very inconvenient times – like after switching my alarm off. OMG, can’t think of anything weird though! 4. We finally find out some very interesting information about Granuaile and I don’t know about you, but I certainly wasn’t expecting to find that she’s sharing her head with someone else. What about you, did you expect anything along those lines? If not, what were you expecting concerning Granuaile? Nope. I really didn’t see that storyline with Granuaile. I thought she might be a ‘romantic’ interest for Atticus – and of course I think that still may be the case. I think it makes sense for the two of them not to get together but to have a sort of ‘tension’ between them. She seems like a good character and I like her already. 5. Laksha is a witch, a truly evil one at that for many of the things she’s done in the past. However, she’s supposedly seen the error of her ways. Do you think she really has? Would you be willing to trust her? Do you think Atticus is smart to have decided to trust her to help him with the “other” witches? I think Laksha can be trusted to an extent! But with a large “Caution” stamp!! She is old – she’s been around and seen a few things, and basically although she’s trying to atone for some of her past misdeeds I wouldn’t say she’s a totally ‘soft and fluffy’ character. I like the fact that she seems to make a pact and stick to it and she’s certainly powerful and useful to have when in a tight spot! I would not want her to become an enemy that’s for sure. And, so, moving on to week 3 of the readalong for Hounded by Kevin Hearne. Schedule and questions/answers below – but if you havent already read this beware of spoilers. 1. I love Leif Helgarson, Viking Vampire, Esq. I have to say that combo makes a pretty cool attorney. If you could have a paranormal/mythical beastie (or combo) covering your tuckus in court, what would you choose and why? I like the vampire attorney – I suppose the drawback is that he isn’t available 24/7 and I don’t think I would be totally happy to pay him in blood. But he has been a pretty good attorney so far. I think on the whole I would probably choose a member of the fey (provided I know their real name of course) they’re very twist and turny after all! I love dogs and I love most breeds even lovely Heinz 57 (which in my country means a mongrel). Currently I own a Fox Hound and a Lakeland Terrier and they are both total maniacs but prior to this I have owned Irish Terriers (Winny and Molly) and two Elk Hounds (which are beautiful spitz dogs, high in stature with a tail curled over their backs, silve coat and black muzzle called Sabre and Ragan). If I was going to choose what to own next I don’t know how I would pick! Maybe a husky. 3. Malina Sokolowski and the other Sisters of the Three Auroras coven have my antennae up. What is your opinion of them? Being ahead with the books it’s difficult to answer this one without looking like a smartie pants. I’d like to say that I don’t trust the witches but did I really feel like that before I knew what I now know? I dunno! 4. Brighid, goddess of poetry, fire and the forge, gave Atticus the power of Cold Iron, which can be used to fight off that nasty lilttle hellspawn. If you could wield one magical power, what would it be and why? I can’t decide between being able to fly in order to beat all the traffic on the way to work or having the ability to set things up to clean my house – like the vac automatically working or the dishes being washed – a bit like in Harry Potter. I would love to say I’d like to get all my cleaning done but to hell with that – on the whole, I’d like to be able to fly and the cleaning can wait! 5. The cops show up at Atticus’ shop to search for poor Oberon, who remains magically hidden throughout the ordeal. What is the one thing you would do if you could remain hidden from sight? I want to hear some good answers for this one! For the next few weeks I will be joining a number of bloggers and commenting and answering questions about Hounded by Kevin Hearne. I love this series! It’s so fresh, the world is brilliant and Atticus is an amazing Druid with a cool Deerhound who he can communicate with. The thing I like the best about this series is that Kevin Hearne seems to be really enjoying himself righting about the characters and it really comes across with the humour. 1) Kevin Hearne had the most perfect beginning for this book: “There are many perks to living for twenty-one centuries, and formost among them is bearing witness to the rare birth of genius.” If you were to live for centuries what do you think you would be excited to see? If I could have lived for 2000 years like Atticus I think the most exciting thing would be to meet some of the amazing people who have now passed away. But on top of that if you really had that much time I would like to travel and see the world. 2)In the 2nd chapter we learn about the amulet and its protection powers! Do you think having met the Morrigan and heard about Aenghus Og that it will be enough to protect Atticus? I mean the Morrigan has a point about hot chicks coming after him and his defenses might be down! He is very male! I think his amulet will be enough to protect him – after all he spent a L O N G time making it and poured a lot of himself into the magic. To clarify though – I think it will only protect him against magic attacks – as for defence against feminine charms I think he’s on his own with that one! 3) The literary world’s coolest dog is introduced in this chapter! Did you love Oberon immediately? Show me a picture or describe the type of animal you would love to have as a talking companion! (Cat, Dog, Mouse, Sloth, Horse—what is your pick–pictures please)? I love Oberon – and more to the point his relationship with Atticus which is so funny. My initial reaction would be to say my dogs – I have two. But, on reflection perhaps I would go for something else. Mmm, no, going to stick with the dogs – you can walk around with your dog and nobody would be suspicious after all. The picture below is actually my brother’s dog – he’s called Jake and he’s a year old and really gorgeous. I would dognap him but he’s so big he wouldn’t fit in my house! (Plus Dude and Jack would be very unhappy). 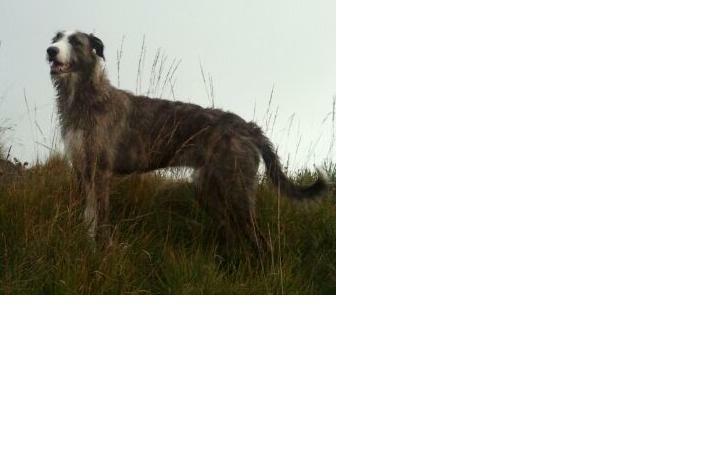 Jake is a Deerhound lurcher and he is exactly what I picture when I read about Oberon. 4) In this chapter Flidais asked Atticus what his name is and then precedes to ask if anyone actually believes he is Greek? He says nobody pays attention to names here. Do you know what your name means and where it comes from? Or do you have a name you wish had? Let’s talk names! To be honest I had no idea what my name meant so I just looked it up – and apparently it is celtic – and means waterfall! 5) We learn about Atticus’ lawyers in this chapter, a rather unique combo! Without jumping ahead, would you hire a lawyer combination of two supernaturals who on the surface would appear to be natural enemies or at the very least two very Alpha attitudes? What would be the positives and negatives of that decision. Well, I think it would be good to have these two lawyers. They know what’s going on and how to get out of a spot. Plus they have lots of backup! They also know about Atticus and so he’s never in the tricky position of having to explain himself. On the negative side I guess you’re a bit bound by certain laws of the supernatural which are restrictive in some ways but on the whole I think the pros outweigh the cons!